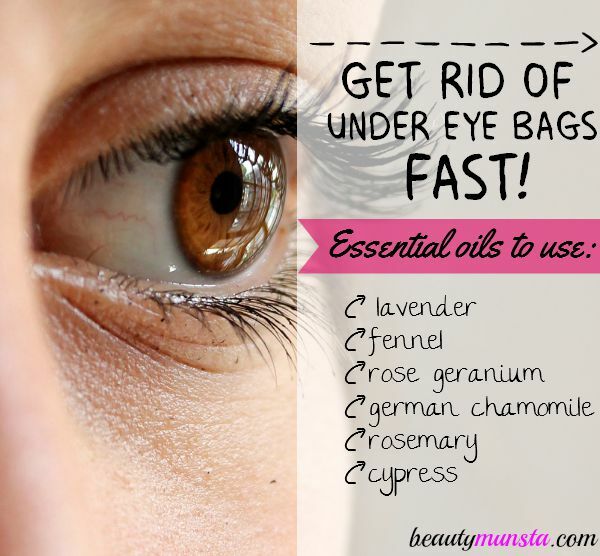 6 Essential Oils for Under Eye Bags | How They Work & Recipes - beautymunsta - free natural beauty hacks and more! 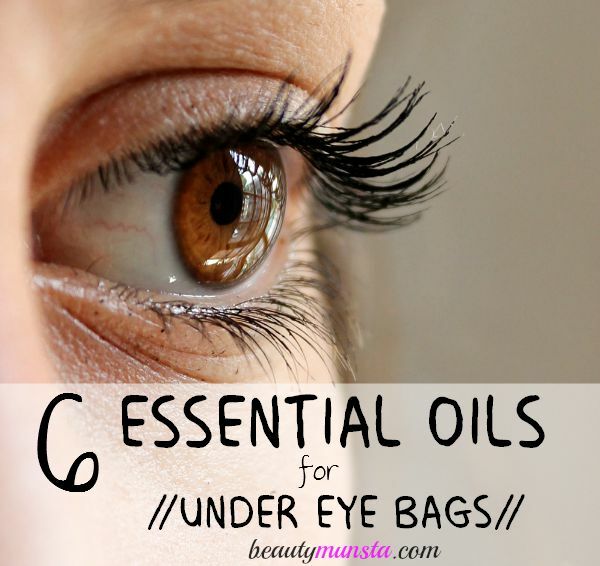 Find out how to use essential oils for under eye bags in this article! Say Goodbye to Under Eye Bags! Under eye bags, although commonly associated with aging, can also caused by allergic reactions, fluid retention, eye infection, irritation and more. For some people, under eye bags can appear right before their period so hormonal changes can also be a cause. Splash your face with cold water. Waking up to under eye bags is not a beautiful sight but sometimes, just splashing your face with cold water helps get rid of them. Cold spoon trick. Chill a spoon in the refrigerator for 5 minutes. Get it out, lie down and gently place it under your eyes. Tea bags. When it comes to puffy eyes or under eye bags, applying tea bags are a common remedy. Brew a hot mug of chamomile/green/black tea and place the soaked tea bags under each eye. Don’t forget to sip up the tea as well which will help drain out excess fluid in the body. 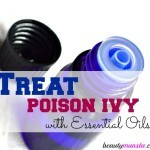 Essential Oils to the Rescue! Want a super quick relief from those unsightly & sagging under eye bags? Use essential oils! 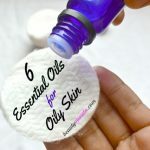 Below I’ve listed the top 6 essential oils for under eye bags. I’ve also included some juicy recipes to show you how you can use each essential oil. Caution: Please do not apply these essential oils on your eyelids or around your eyes but just under the eyes on the eye bags. Applying it over the eyes can cause the essential oil to seep into your eyes! 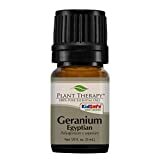 ► Geranium Eye Gel: Mix 2 drops of geranium essential oil in ½ tsp ofpure aloe vera gel. 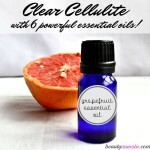 Gently apply this under each eye to reduce puffiness & swelling and make skin taut. ► Fennel Eye Bag Fix: Mix a drop of fennel essential oil in ½ tsp of witch hazel. Gently apply this on your under eye bags when you wake up in the morning. ► Lavender Coconut Eye Cream: Scoop out ¼ tsp ofcoconut oil and apply a drop of lavender essential oil to it. Mix well with your clean index finger and massage it on your under eye bags. This way, you will not only decrease the size of the under eye bags but also keep the area free from wrinkles & fine lines! 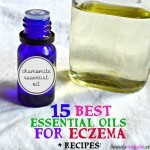 German chamomile essential oil has anti-inflammatory properties that help reduce swelling. Chamomile tea bags also work great in alleviating under eye bags but if you don’t have the time to lay still with tea bags over your eyes, check out the recipe below! ► Calming Chamomile Eye Serum: Fill a 10 ml roller bottle with your favorite carrier oil for skin such as jojoba oiland apply a drop or two of chamomile essential oil. Shake well and apply under each eye with a clean fingertip/q-tip before bed. ► Cypress Shea Under Eye Soother: Place a drop of cypress essential oil in ½ tsp of shea butter and mix well with a clean index finger and apply on your under eye bags. 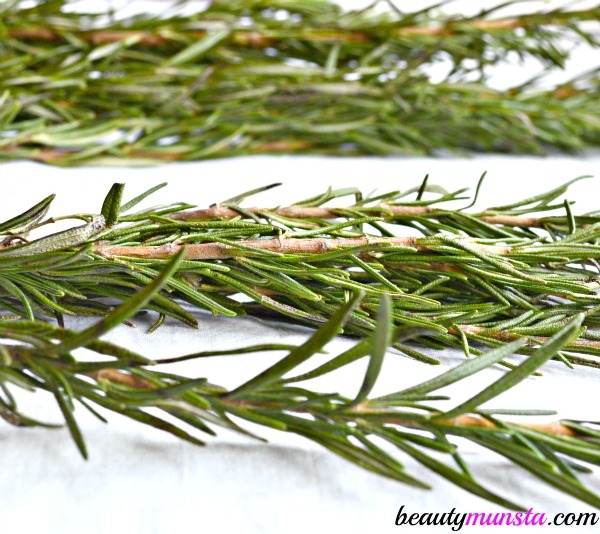 ► Rosemary Green Tea Under Eye Toner: Next time you brew yourself a steaming mug of antioxidant-rich green tea, save some for those under eye bags! Let the green tea cool down completely, then soak a clean cotton ball in it and add just a drop of rosemary essential oil. Gently dab it under each eye to tighten, tone & reduce swelling. Please be careful when using essential oils for under eye bags, puffy eyes or any other under eye ailment. Do NOT let it get it in your eyes EVER because it can burn like crazy. If it enters your eye, its best to flush it out using a carrier oil such as fractionated coconut oil or whole milk. 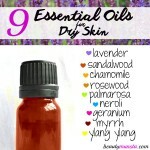 Never use essential oils ‘neat’ or undiluted on your skin since they are very potent. Always dilute with a carrier oil first in the ratio 2 drops of essential oil to 1 tsp carrier oil. 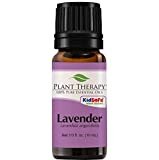 Please see How to Dilute Essential Oils for more information. 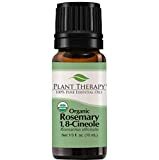 If using an essential oil for the first time, add a few drops to a carrier oil (2 drop of essential oil in 1 tsp carrier oil) and apply on your inner elbow to see it is safe for you to use. Carrier oils include coconut oil, sweet almond oil, olive oil, etc. If you are pregnant or lactating and would like to use essential oils for under eye bags, please first consult your doctor as most essential oils are not safe for pregnancy and newborn babies. Keep essential oils out of the reach of children and pets as they can be harmful and toxic. And lastly, always buy 100% pure and high quality essential oils! If you’re new to essential oils, then please first read Caution & Safety when Using Essential Oils before applying them on your body.